After a post in Donald Robertson’s facebook group on meditation sucked me into a comment thread, I noted a statement by my friend Yannos that piqued my interest. In discussing the topic, I had mentioned that there’s no account of sitting or breathing meditation in the Stoic corpus, like we see in Buddhism, for example. Yannos commented something like, “No, they were standing.” I had not heard anything like this before. In speaking with him privately, he gave me some reading homework to do. 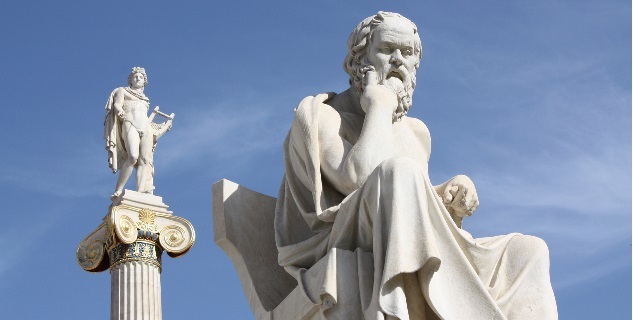 In Plato’s Symposium there are two accounts of instances in which Socrates in engaged in a behavior which seems to be a meditation or a trance of some sort, and in both he’s standing still. It’s also clear that he’s not praying, as in the one account he prays afterwards. I tend to go to Xenophon for my Socrates-reading, and (perhaps embarrassingly) haven’t read too much of Plato. Time to correct that, it seems. The two passages in question are: 174d – 175c and 220c-d. I will briefly paraphrase them here. Socrates invites his friend Aristodemus to a dinner party which is hosted by Agathon. Along the way, Socrates begins to lag behind, and he waves his friend onward. Upon arriving to the house, he takes up a post at the neighbor’s porch, and stands meditating. Aristodemus enters the house, and Agathon asks where Socrates is, and sends a servant to collect the man. When asked by the servant to come in, he refuses. When the servant reports the happening, Agathon orders him to continue to pester Socrates until he comes in, at which point Aristodemus intervenes and asks the host to let Socrates be, as this is a habit of his which he does frequently, regardless of time and place; and that he will be along shortly. Agathon agrees to do this. A short time later, proving Aristodemus correct, Socrates enters. The mark of wisdom is clearly visible to Agathon, who asks Socrates to share it with him. Socrates declines, and says that if such a thing were possible, to shift wisdom from one to another as a wick will move a liquid, he would. But alas, it is not so. Two things are worthy of note here, the first is that in this state, at least in the beginning, Socrates can and does interact with others. He speaks to Aristodemus and to the servant of Agathon. The second being that this occured frequently enough for others to know of it as a habit of his. It is a practice or exercise which Socrates engages in often. Alcibiades tells the dinner guests of another such time Socrates stood, but this was not short venture as the one of early this evening. At Potidaea, in the Peloponnesian War, Socrates “joined his thoughts with himself” (συνεννοήσας), and stood still from morning, through lunch and the evening, and all through the night until the next morning. Alcibiades states that we would not give up, suggesting a commitment to the process despite outside pressures. It was such a sight, that others brought their bedrolls outside to watch. In the morning, he greeted the sun with prayers for the new day. From the words above, we can look at some English words which help us see what Socrates is doing inside, he’s turning his thoughts inward, examining himself, contemplating, inspecting, looking out for something, etc. His practice involves him standing, sometime shortly, other times for a very long time, and engaging in this work. He stands away, so it’s personal, but he does it wherever he happens to be, so it’s not private, and it is without concern for time or the events of others, so it is not a public display. I hope this delimits the practice somewhat. Additional, this Greek Word Study Tool is useful as you can look up words in their full, inflected form without knowing the nominative/dictionary form. In the beginning, at least, Socrates can and does speak to others. Later he seems to ignore other people, but it’s unclear to me whether he cannot, or simply does not do so. In the Alcibiades passage, his commitment to seeing the practice through is evident. Alcibiades states that Socrates would not give up, and he stood there contemplating for a day and a night. Quite a mental and physical feat. Neither passage tells us what Socrates has gained from the practice, we only see it through the eyes of others like the three mentioned before. I have not found much scholarly discussion on this topic. This paper, which is partially on topic for us and partially off, states that the event is a trance. I’m not convinced this is the case. It seems to me to be a meditative and contemplative exercise, but I could be misconstruing what’s meant by trance as the author uses it. Also, in my preliminary readings, I came across a Google-scan of an old book which I cannot now find again, where the author laments that this passages is an example of many scholars cramming their own ideas into ancient texts, eisegisis (a word Chris Fisher recently taught me). This book notes two sources, one who uses this passage to state that this is evidence Socrates was a Pythagorean mystic, and another who uses it to claim that Socrates was figure of Science (with a capital S, clearly). It’s worth noting that this is a real and present risk in the kind of work we’re engaged in here, so the reminder is timely and helpful. It does seem fair to me that this practice can be classed as a “spiritual exercise” as Hadot would label it, and that it could be a valid practice for contemporary Stoics of any stripe. For me, this sort of evidence, while a bit thin, is an interesting line of investigation which I prefer to porting over a practice from some other school or religion. I will be making use of it in the coming weeks and months, and will report back any findings of note. Normally, I would detail a plan or instructions for others. But as I’m writing this before engaging in a long-term experiment with the practice, I think that such a thing will be a future post after some experimenting is done. So, I apologize for the lack, mea culpa. If you decided to add this Socratic Meditation to your practice of Stoicism, please report back in the comments. For those of you who have been following the blog for the past two and a half years, thank you. If you wouldn’t mind also signing up for the email list, I would certainly appreciate it. I won’t spam you, and you’ll get a first crack at news, ebooks, and other philosophy-related stuffs. Thanks again. 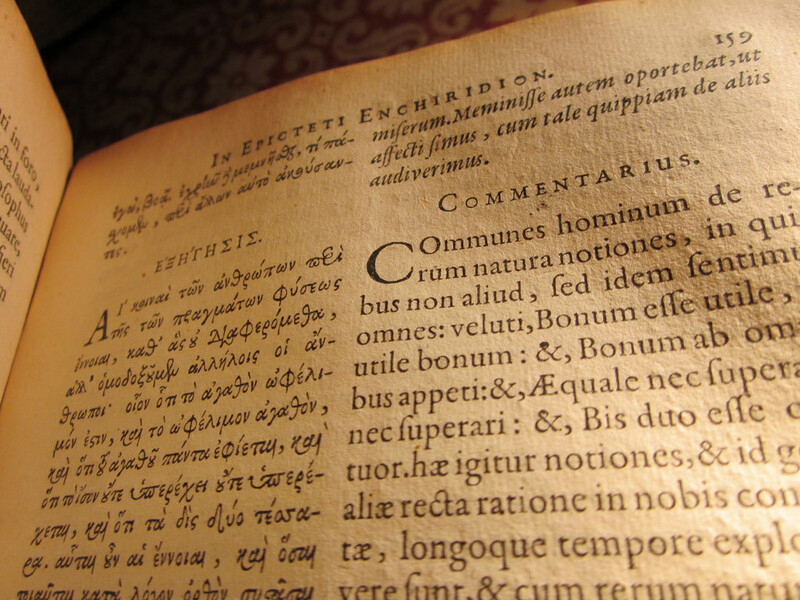 One of the most frequently used pages by visitors on the blog is The Stoic Bookshelf. I’ve been very good about buying new books, mediocre at reading new books, but entirely atrocious at updating that list. So, I’ve made some updates and additions there. That page will be undergoing a pretty serious overhaul in the coming weeks. But, for the time being, head over and see what’s new. I have just finished reading the section of Plutarch’s De Moralia “On Curiosity.” The Greek word in question is a bit difficult to translate, so you also see “On Being a Busybody” used. The thrust of the essay, is an argument against the sort of curiosity which feeds on knowing the failings of others. The gossipy nature, the uncovering of secrets, etc. So the essay both argues against this, showing how this nature is at the extreme leading to things like adultery; and it offers a therapy to undo these habits. The fact that gossiping and nosiness are habits is an important one. If you will permit the liberty, I’ll transpose some of his exercises to the utility of today as well as note the examples given. Plutarch suggests that we not read every bit of graffiti, or signage that we pass. That this little intrigue reduced our ability to study and descent important things, and trains the moral will into insinuating ourselves into things not our business. He suggests that when we’re walking, we don’t peek in the doors of neighbors. We might also practice not checking out the workspace of our colleagues, and keeping our attention outside of their offices, cubes, or desks where we might work. Turn the gaze inward, to the self, and not to others. 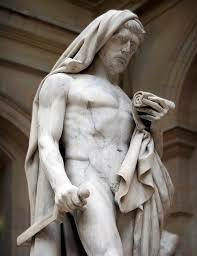 Plutarch suggests that when a letter arrives, we delay opening it for a time. This can be true for email, push notifications for smart phones, and the other ten-thousand digital intruders of the day. We may even block those things into chunks: to check email once or twice a day, turn off the push notifications from Facebook, YouTube, or our favorite Stoic blogger, and instead only give a set amount of time to these things each day. 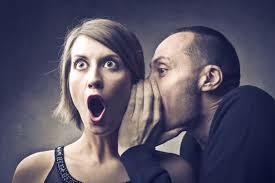 One of the things which Plutarch mentioned, is that the person who loves to uncover secrets also loves to share it. I suspect that the second part is easier to wrangle than the first. We might adopt an purposeful silence, not sharing the social tidbits which we might uncover. This will lead in time to a reduction in the former. I suspect that part of the allure of sharing gossip is being perceived as the person “in the know.” Restricting such speech, then, will immediately curtail this feedback. Plutarch remarks that the very people who seek out such knowledge are the ones we hide it from, and so the work of the gossip is twice as hard. While not a Stoic work per se, this fits nearly into many philosophical settings. It’s short, and I recommend it to your reading. It is important to remember how we train the moral will, and what small things lead to greater.